It's time for another edition of Five on Friday and I hope you'll join in! All you have to do is post about five things on your mind, add the Five on Friday logo (found at the bottom of this post), and join the party using the linky tools found on Smidge of This. It's easy, and a great way to find new blogs to read, and a great way to be found! It's safe to say we haven't started our diet yet. It's so hard to get motivated to start. It's winter. All you want to do is cuddle in bed, with a hot drink and watch movies and be lazy and eat junk. I need this pattern to stop though. I really wanted to get started on Monday this week, but it was a flop. And with our anniversary, and my friend's baby shower coming up next week, it will be hard to avoid temptation. Maybe I will just be realistic and start after that weekend. There won't be any excuses after that. 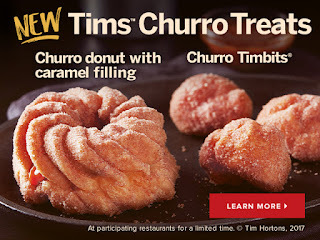 Speaking of junk food... fellow Canadians, did you see that Tim Hortons released a Churro donut and Timbits? Being Roll up the Rim season, I decided to stop by and get a coffee and churro donut. However, I must say I was kind of disappointed. Don't get me wrong, the donut was good. It's essentially just a honey crueller dipped in cinnamon sugar. It's supposed to be caramel filled, but mine had none. I'm also 0/2 for roll up the rim. 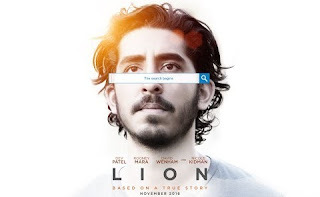 Have you heard of the movie called Lion? It was released in November 2016. I hadn't heard of it, or seen any previews (honestly, we don't watch much cable television here, so that might be why.) but this was an excellent movie. Taken from Google "Five year old Saroo gets lost on a train which takes him thousands of miles across India, away from home and family. Saroo must learn to survive alone in Kolkata, before ultimately being adopted by an Australian couple. Twenty five years later, armed with only a handful of memories, his unwavering determination, and a revolutionary technology known as Google Earth, he sets out to find his lost family and finally return to his first home." It's sad to think that this actually happened in real life. And the story is sad, but there's a happy ending. It was shot beautifully, and the story just keeps you interested the whole time. I'd definitely recommend checking it out. The first half is in Hindi, but there are subtitles. Eventually it does switch over to English. But a great movie, again, I recommend you check it out! 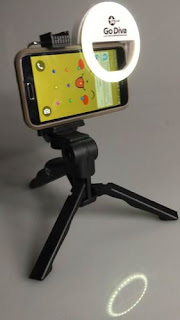 I ordered a go diva selfie ring light for my phone! Well, it's a little light with a tripod for my phone. I take all of my photos that way, and sometimes the lighting is just no good. I do need a better camera, but this is all I have/can afford at the moment. So I work with what I have! I'm really hoping I can turn the light to use with the back camera as well, and use that as better lighting on non-sunny days! Fingers crossed! I also hope this will push me to do more eyeshadow looks, or actual lip swatches. I don't do them as much as I should, and this will help with the lighting issues! I ordered this on 02/02 and received an email on 02/07 saying it shipped. I will keep you all updated on when I receive it! If you're interested in checking it out, here is the link. It was regularly $29.99, but I found a coupon on their instagram for 15% off, making it $25.49usd, and free shipping. So, I'm really hoping it will work both ways I'm thinking of! 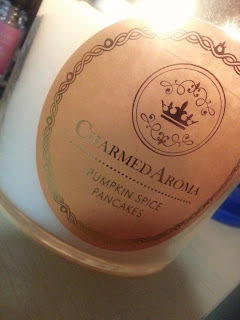 I told you all I would update you with my Charmed Aroma goodies! Back on Boxing Day I placed an order for two candles. During their promotion, they would send you a third candle for free. 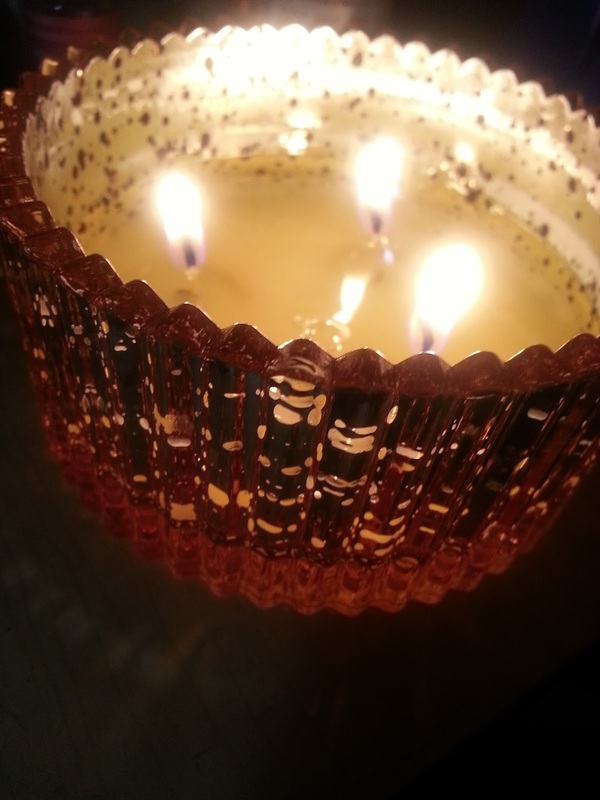 The free candle I received was their Strawberries and Champagne candle. This one contained a ring. It's a pretty heart in the middle. 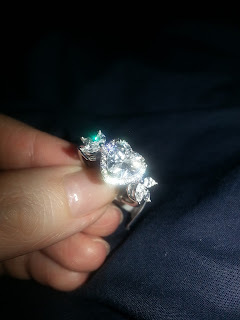 Surrounded by smaller "diamonds".. it's a pretty ring, and actually fits my fingers (usually they are too big) but I feel like it's a little too bulky for my small hands. This one was valued at $150. Now, I don't really believe these are worth these "appraisals".. so it's more for the fun of finding jewellery in your candle. Next up, I also received Pumpkin Spice Pancakes. I was a little iffy about the scent on this one. I love pumpkin spice, but I wasn't sure how strong it would be. And let me say, I'm so glad I ended up going with it. It has the slight scent of cinnamon, but it's also sweet, and vanilla'd. 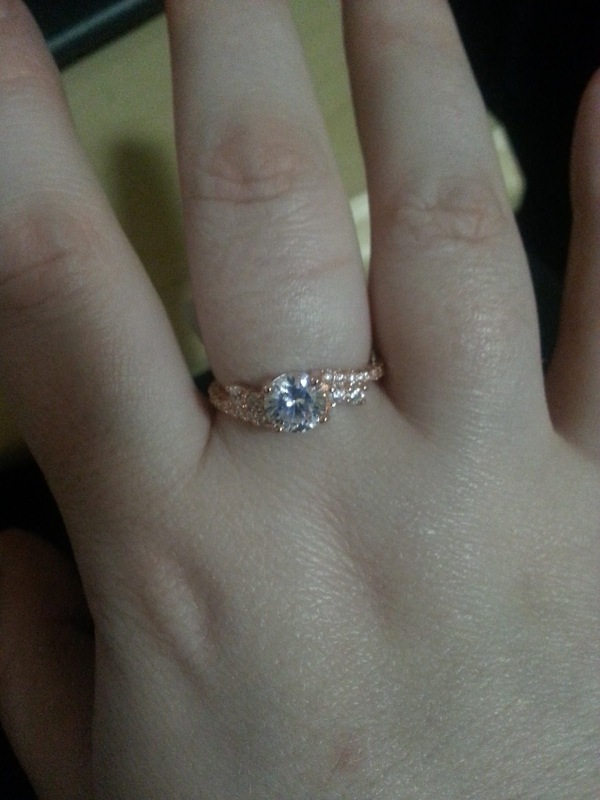 I received a rose gold ring. With a round cubic zirconia stone. It's pretty, I thought I would like the rose gold, but it just looks kind of cheap. They gave this one a "value" of $70, and there's no way that's true. I think I might try and pass these rings on. Lastly, I also received a two-wick candle, just like the Pumpkin Spice Pancakes, but in the scent Toasted Marshmallow Cookie. Another sweet, bakery scent. I really like the scent of it as well. This time, I chose a necklace candle instead of a ring candle. I'm so glad I chose the necklace, because I can see myself wearing this! It's simple, but pretty. It's 3 small circles, one is silver, one is rose gold, and the smallest one is cubic zirconia "diamonds" all around. It did come knotted where the circles are sitting, and I undid it. I'm thinking I made a mistake and the knot holds them in place from moving around. Oops. Either way, I liked this the best. This was valued at $150. Again, I don't think it's actually worth that much. 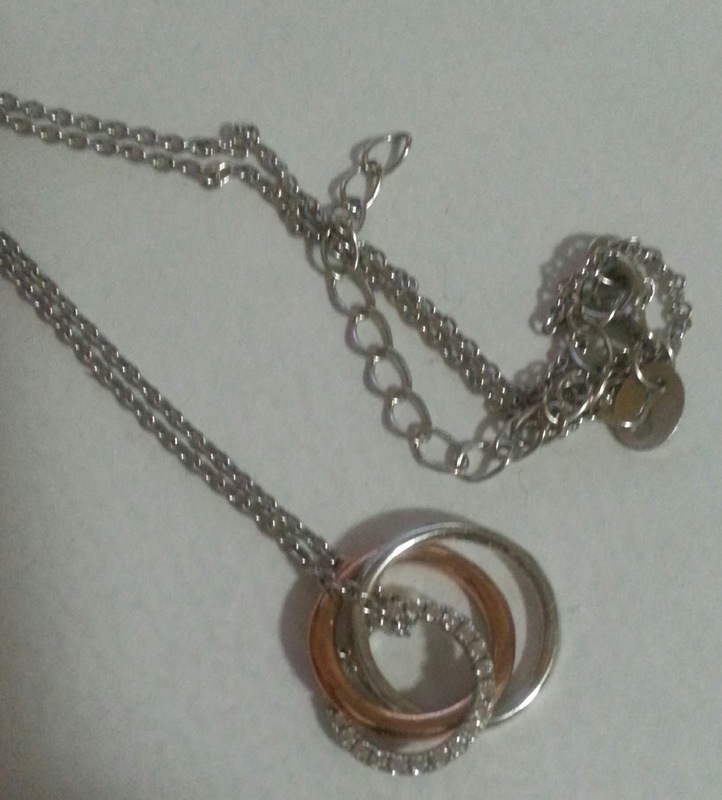 But I'm happy with the necklace more than I am with the rings. But, it's all about the surprise in the end. I would repurchase these candles in the future, because I find them just as good as bath and body works candles, and they would be fun to give as a gift.. but, I will say that B&BW usually has good sales on theirs. So these would be good as a gift, or occasionally. To me at least. 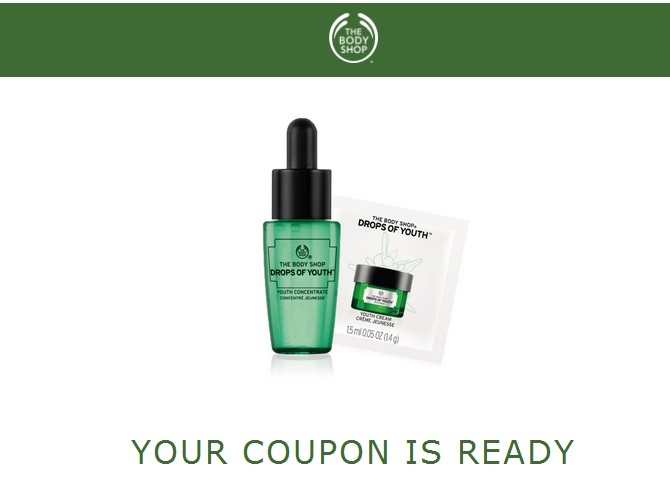 I received a coupon to try samples of The Body Shop Youth Concentrate and Youth Cream. I've heard great things about both of these products, so I can't wait to stop in and get mine. 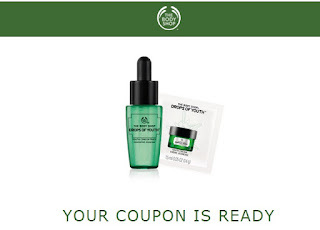 I'm always looking for good skincare, and The Body Shop has great items to choose from, for all skin types! I'll keep you updated on when I get it, and finally try it out!